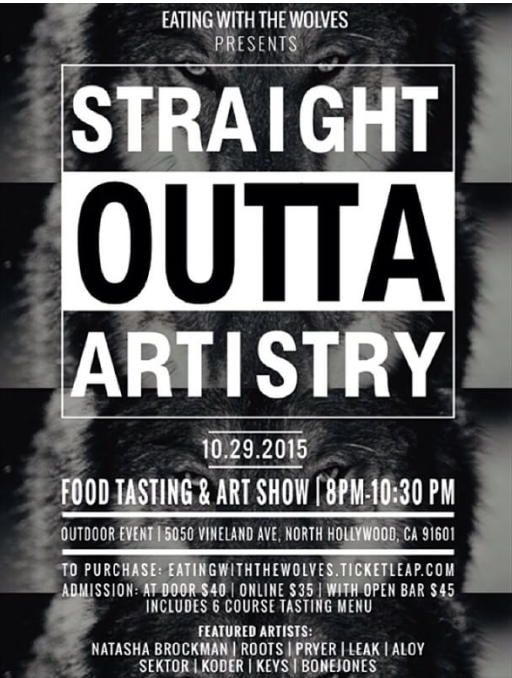 On October 29, 2015 Eating with the Wolves presents “STRAIGHT OUTTA ARTISTRY” a night filled with an exquisite six course meal menu and pop up art show. Located at NOHO’s very own Tea Pot 5050 Vineland Avenue, North Hollywood, CA. 91601. Doors will open at 8:00pm-11:00pm. See you all this very exclusive evening; a private never before scene art collection by Pryer, Roots,Bonejones, Aloy, Natasha Brockman, Leak, Sector, Koder and Keys. Eating with the wolves is a sensual dinning experience, introducing your palate to fusion flavors, and comfort cuisine. We Wolves are chefs passionate and trained in our craft, full of creativity and the desire to introduce ourselves to the world through taste. Open your mouth and experience tongue tantalizing, sensory overload brought to you by the wolves. 6 course tasting menu and Signature drinks will be available! Yes people all for $45 dollars. We are making our first event exciting and memorable we hope you enjoy the show. Please note that the event is an outdoor event. Halloween costumes are allowed. Hope to see you there!